As the US government shutdown continues, it’s unclear when the USDA will be releasing the monthly WASDE report that is scheduled for next week. To understand the consequences, Gro looked back to a period of market volatility in 2013, the last time this critical data was delayed because of a government shutdown. WASDE, or World Agricultural Supply and Demand Estimates, is the most closely followed report from the USDA for major commodities. 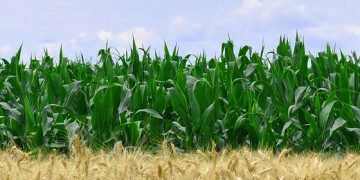 It pulls together worldwide data on crop production, stocks, consumption, exports and imports, and other metrics. Regular, monthly releases of WASDE keep farmers, cooperatives, processors, merchants, traders, lenders, insurers, food companies, and others up to date, thereby reducing uncertainty and market volatility. 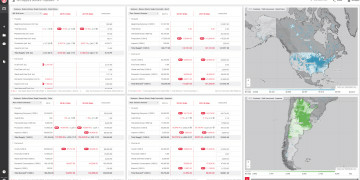 During the shutdown, Gro Intelligence is offering free subscriptions to the Gro data platform. Interested users can click here to access and download all of the data you need until the government fully reopens. Gro Intelligence has access to many of the US government’s back-end data feeds and has stored all of the historical data. We are sharing that data, along with all global data and models in our platform, with the world. The January release of WASDE, one of the most important reports during the year, contains final crop production estimates for the prior growing season for major crops like corn and soybeans. This month’s report is scheduled to come out on Jan. 11. Varying media reports claim the USDA may decide to release the report on schedule regardless of US government funding, while others say WASDE won’t come out until after the shutdown is resolved. Yet another media report says the USDA will need additional time to complete the January WASDE report once the government is up and running again. In October 2013, at the end of the crop season for major commodities like corn, the US government was shut down for 16 days, canceling that month’s WASDE report release. When the USDA next issued a WASDE report some data showed big changes. The US corn yield, for instance, had abruptly jumped a substantial 5 bushels per acre, to 160.4 bushels per acre from 155.3 bushels per acre reported in the September 2013 report. Had the October report actually come out, it presumably would have prepared the market to expect rising yield estimates. 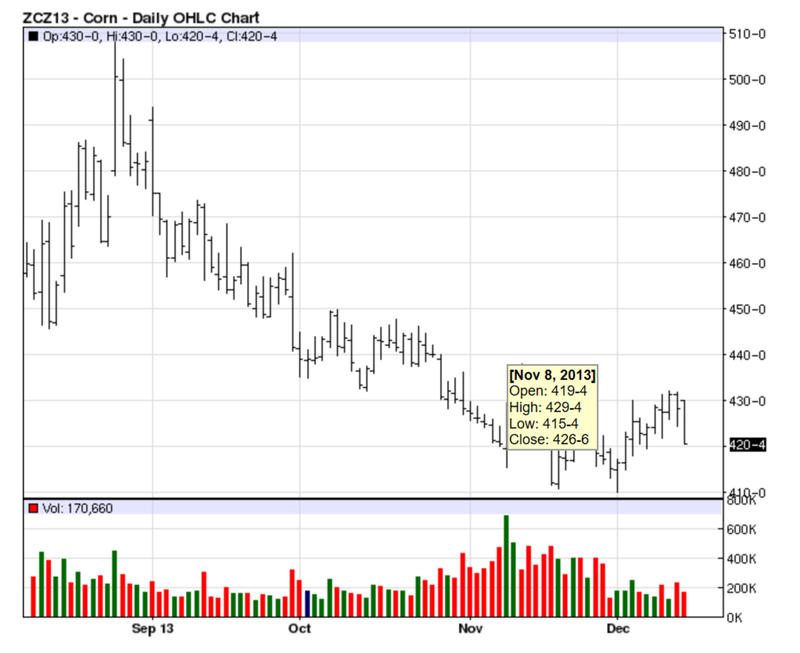 On the day the November WASDE was released, corn futures prices, which had been tracking lower for a couple of weeks, made new lows but then jumped sharply. Other data delays occurred during the 2013 government shutdown. 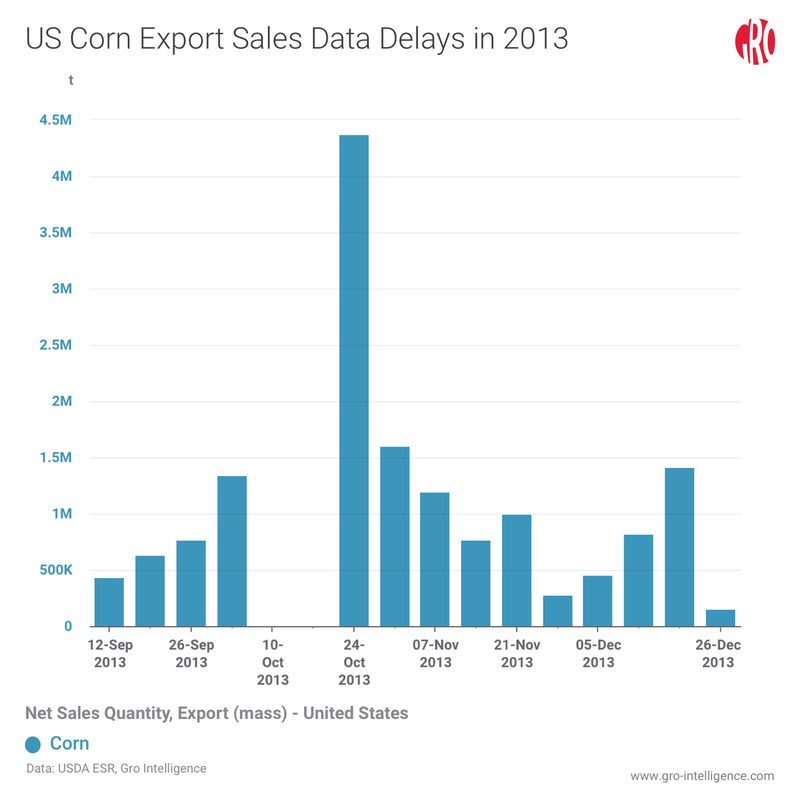 For example, corn export sales data, a weekly announcement, skipped two weeks in October. When the data finally came out on Oct. 24, the USDA’s Foreign Agricultural Service (FAS) lumped three weeks of export sales together to report 4.4 million tonnes. Not only was the data delayed in reaching market participants, but the cumulative number also could have caused confusion to some participants used to seeing weekly export figures of around 1 to 2 million tonnes. 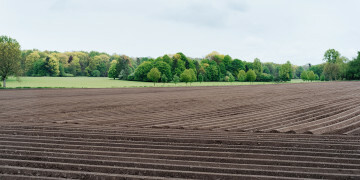 A handful of market participants, such as ADM, Bunge, Cargill, and Louis Dreyfus—commonly referred to as the ABCDs—have the ability to track weekly US export sales through their own assets, sales, shipments and do not have to rely on USDA weekly export sales nearly as much as the rest of agricultural market participants.